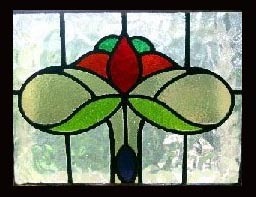 The principal characteristic of English Art Nouveau stained Glass windows is their sinuous line. The principal subject is nature, whether stylized or realistic. English Domestic nouveau windows are said to be similar to romantic book illustrations. Nouveau art glass. Made its presence known at the first Worlds` Fair; held at the Crystal Palace in London in 1851.
figure in the history of decorative arts. His Salon de l'Art Nouveau in Paris gave the name to the movement. Art nouveau stained glass windows should easily be recognized among the extensive galleries below. the deco glass is displayed, is getting rather large. It is intended to divide this in to separate Victorian and Deco galleries in the near future. Click here more information on art nouveau and other antique windows. Click Here For Personal Assistance In Finding Your Window. the comments of previous purchasers.